Saturday, November 10: Moganshan is a ghostly place, particularly on a foggy day in early November. We arrived at the top of the mountain late Saturday morning, and after a slow lunch in one of the few restaurants open during the off-season, I set off alone to explore. 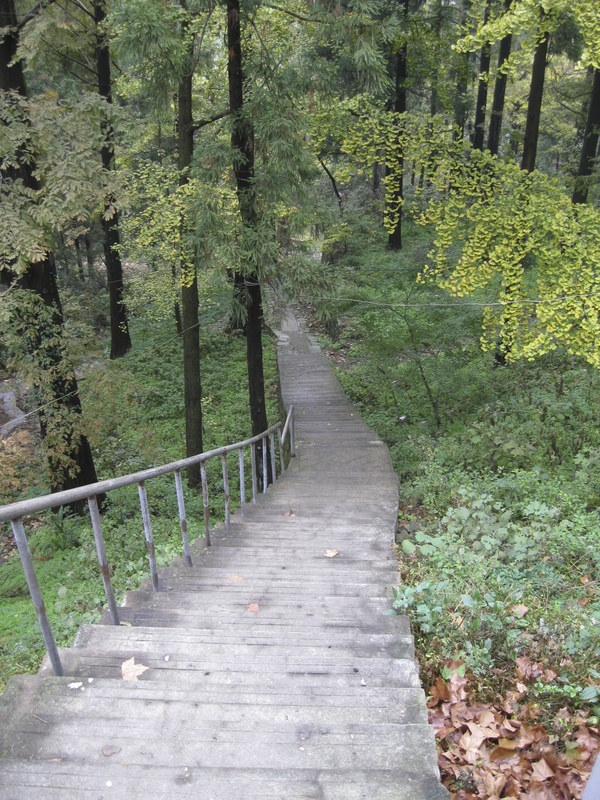 I followed a newly built set of stairs downhill in the general direction of Sword Lake, the source of Moganshan’s founding myth. Legend has it that two Warring States swordsmiths, Mo Ye and Gan Jiang, created the kingdom’s best weapons for their ruler. When presented with the beautiful swords, the king cut off their heads to ensure that no one else would profit from the craftsmanship of Mo and Gan, giving the mountain its name. I was among the first of the group to venture out, and I found myself totally alone on the trail down to Sword Lake. The fog and mist that had dogged our drive up from Shanghai had cleared somewhat, and weak sunlight filtered through the silent woods. I wasn’t worried about being alone, though: Moganshan has some of the better trails I’ve seen in China, with stone steps set into the hills and signposts at major intersections. (On the other hand, I probably shouldn’t have spent Friday evening watching one episode of The Walking Dead after another. I wasn’t worried about robbers or rapists, but zombies were another story.) It’s possibly the most solitary I’ve ever felt in China. I finally reached Sword Lake and encountered a handful of Chinese tourists, who had taken one of the other paths down to the scenic area and were occupied with photographing each other in front of the landmark. Down another long set of stairs I found a small waterfall; after admiring it for a few minutes, I started the upward hike on another trail, one that had more sights along it than the forest walk I had taken down. For a while, I saw more people, too, including some CETers who were coming down the path as I walked back up. But after a while, I was alone again, following signs toward something called the Yellow Temple (Huang Miao) that I had seen in photographs while reading up on Moganshan. The Yellow Temple was where I really began to feel chills, both literally and figuratively. The sun was disappearing again and an icy drizzle falling intermittently. 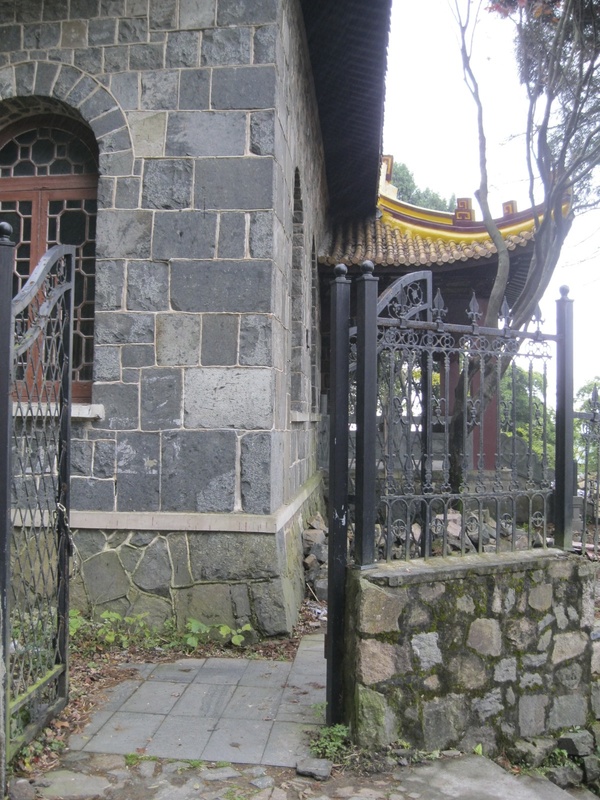 An iron gate swung open to admit me into the temple grounds, which were overgrown and strewn with construction debris. Bundles of yellow roof tiles lay half-buried in dead leaves, while piles of planks studded with rusty nails lay in front of the temple door. It looked like the building had been half-restored, a shiny new roof installed before work had stopped and the site abandoned. I walked around the perimeter of the building and saw broken panes in the windows above my head. At the rear of the temple, the ground rose to meet the windows at my height, and I contemplated climbing in through one that was partially opened. Doing so seemed somehow wrong, though, and I satisfied myself with nudging the window entirely open and peering into the main room of the temple. It was eerie. 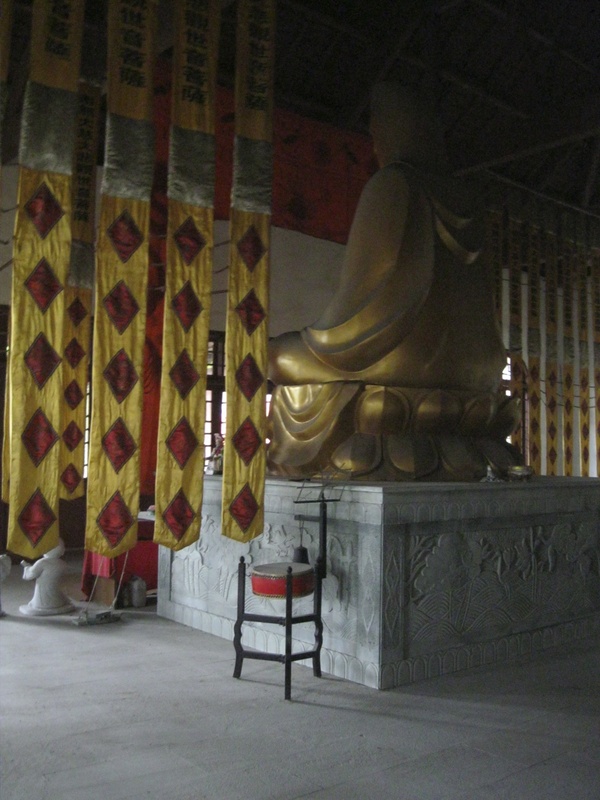 Yellow-and-red banners hung down from the ceilings and an enormous golden Buddha statue occupied the center of the space. Dust and debris had been swept into a neat pile on the cement floor. The walls were empty, save for one piece of framed calligraphy that had been left hanging between two windows. Why was the temple in this half-abandoned state? I never found out. We walked past flat stretches of ground that used to be tennis courts and Kitto pointed out the sites of old swimming pools. 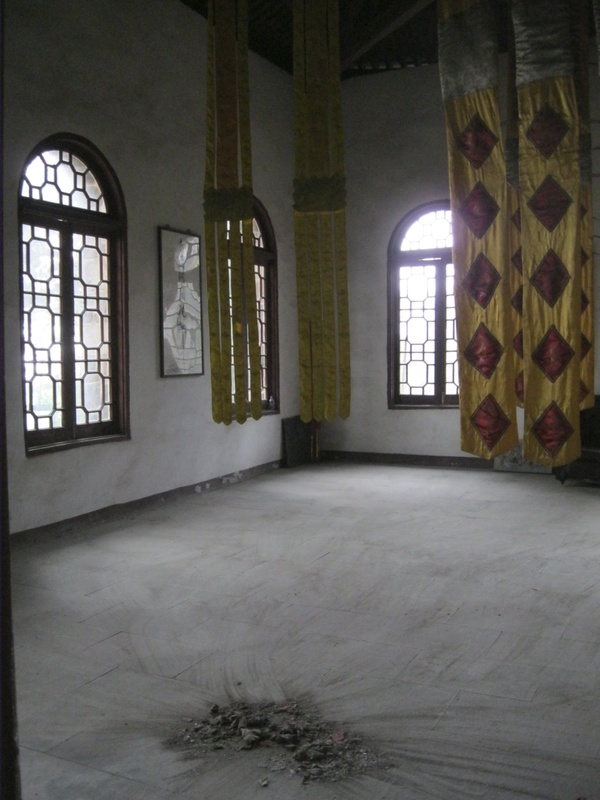 One villa, the only one we were able to enter, had served as the local headquarters for Mao’s secret police, while another was the location of the only murder of a foreigner on Moganshan, in 1912. The light faded quickly and we could see less and less; as we trooped down stone stairs, I was grateful for the flashlight on my cell phone. The mountain was entirely shrouded in blackness by the time we returned to the Moganshan Lodge, Kitto’s first business on the mountain (he and his wife now also run several restored villa guesthouses). The Lodge is modeled after an Alpine mountain resort, a fireplace sitting at the center of one wall and heavy wooden chairs scattered around it. They serve hot chocolate and brownies, whiskey and French fries, and large bookcases are filled with tattered paperbacks available for loan. Even in the off-season, the Lodge was crowded with customers, a mixture of foreign groups like ours and young Chinese couples looking, I assumed, for a romantic weekend escape. 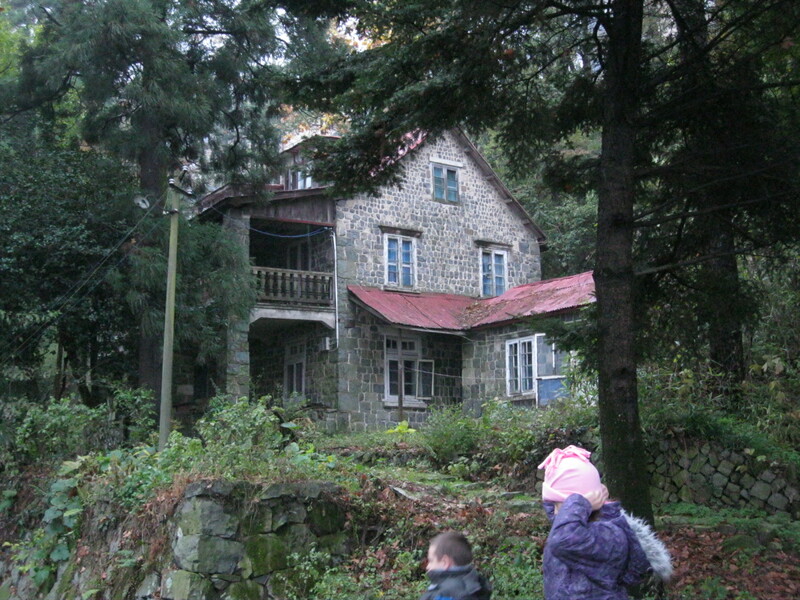 With warm yellow and red-orange walls, the Lodge seems designed to dispel the ghosts of Moganshan. But when I retreated to my hotel room next door after dinner, the wind gusting outside and the lights flickering as I read the new copy of China Cukooo I’d just purchased from Kitto, those ghosts didn’t feel far away at all.